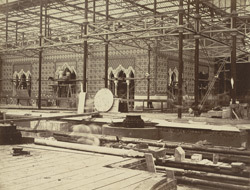 Construction work in progress on Owen Jone's reproduction of the Alhambra Court in Crystal Palace Sydenham. The Alahambra Palace was built in the 13th century by the ruling Muslim dynasty in Grenada, Spain. The name comes from the arabic al-Hamra, meaning red palace.